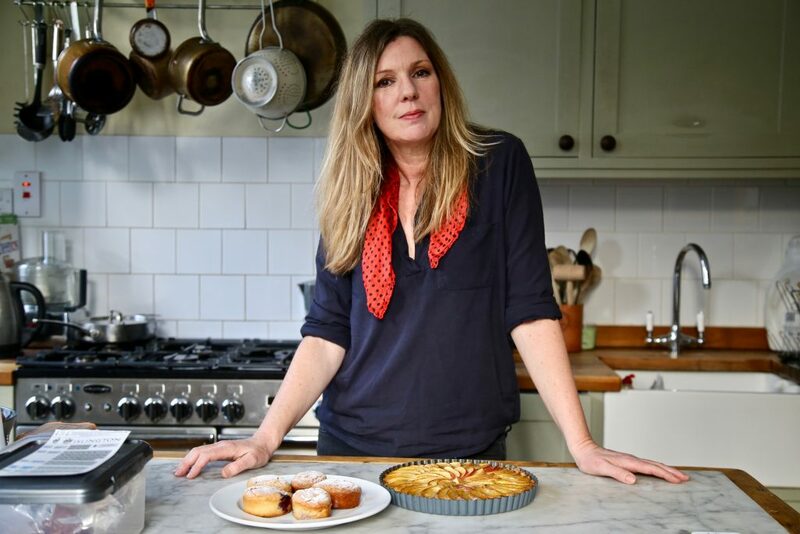 Niki Segnit, author of the groundbreaking book The Flavour Thesaurus, is tall, attractive and remarkably fresh faced considering she has four-year-old twins. Originally from Hampshire, she has lived in Islington for six years. I visited her kitchen, the zinc-topped desk and laptop where she writes, facing the busy City Road. Her aforementioned first book, a guide to flavour pairings, was incredibly popular: it sold a quarter of a million copies, unheard of for a non-TV chef, ‘without a column, or a rich daddy’. As if to cement her reputation, when the Camerons were photographed in their refurbished kitchen at Number 10 Downing St, The Flavour Thesaurus was on their shelf. The ultimate in status shelfies. Her latest book, Lateral Cooking, has been nominated for the 2018 Andre Simon Awards. It is just as unusual as her debut, exploring a ‘genealogy’ of recipes by explaining how one recipe is related to another. A basic formula can be tweaked to turn pasta into pastry, bread into pizza, custard tart into crème brûlée. Each chapter has a section called ‘leeway’ detailing variations upon a foundation recipe. “I was a strategist for an advertising agency. I worked with Coke and other big brands. I’d do months of work that you have to condense down to one page, written in a poetic way so the creative side gets it. You brief the copywriter and art editor. I loved it. On the marble counter is an apple ‘tart’ and some raspberry friends. 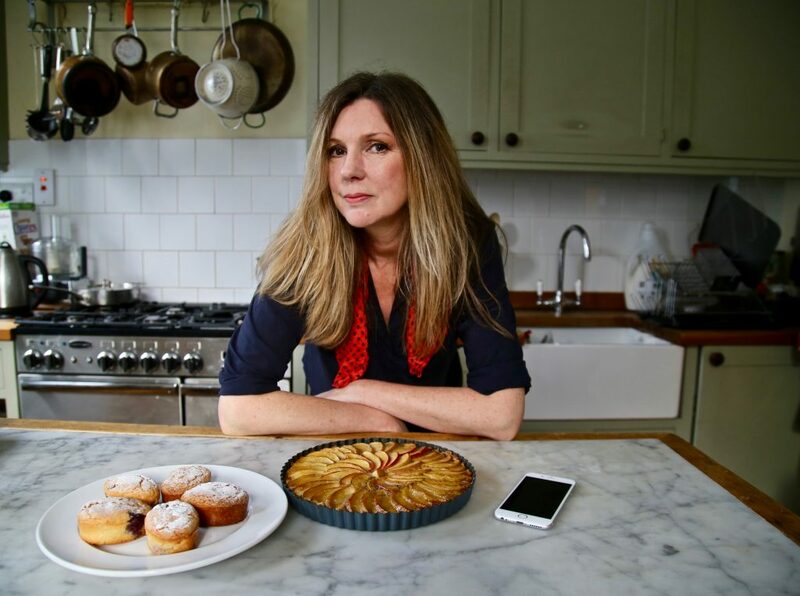 Niki has recently set up an Instagram account and these bakes are perfect ‘grammable’ material. 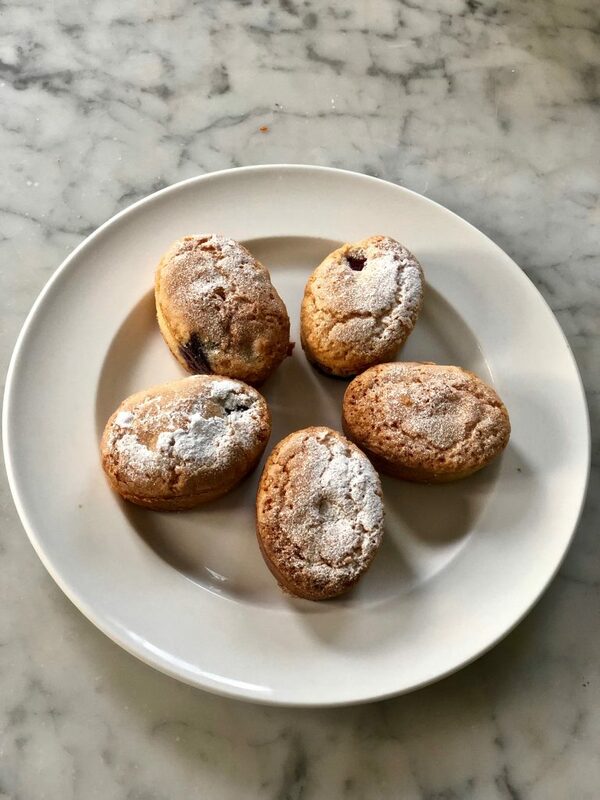 This set of recipes are part of the ‘nut meal’ family, spanning frangipane, marzipan, including macarons, friands, tarta de Santiago, Bakewell tarts and galette des rois. At the moment Niki is working on the American version of Lateral Cooking, re-testing recipes using US cup measurements, volume rather than weight. Very few Americans own kitchen scales. I was interested that you write that one doesn’t have to be ‘gram perfect’ when baking. “Professional bakers have to do things in a way that us domestic people don’t. This whole idea that you must weigh down to the last gram has become received wisdom and it’s not true. It’s quite interesting what leeway you have. Metric is so much simpler. But with the American technique, you have to use your judgement, to know when something is cooked. That’s something I’ve learnt writing this book. I’d like to know about your background, your route into food? I’d never shown any interest in learning how to cook: it was boys, bands, music, clothes, reading The Face, listening to John Peel. … it didn’t matter how many pats of butter you took! “I was very punky, with crimped hair. A few years after that I moved into advertising, starting as a PA. I thought a PA was glamorous, I didn’t realise you were basically a secretary. I taught myself to type. “Then I worked in the art department for a while, I was eventually commissioning photographers and illustrators, leaning over a lightbox with a Chinagraph, seeing photographers books. I loved the work of Arabella Boxer and Tessa Traeger. “By the time I had the idea of writing The Flavour Thesaurus, I was at the point of my career of only working on food and drink brands. I was very into cooking. A lot of people are. A lot of people will say nobody is interested in cooking, but it’s not true. I was running the data. “I had access to a giant data base, in which you ask questions of 26,000 people. I saw the results of questions like, ‘I strongly agree that I’m a very creative person’ alongside ‘I strongly agree that I love to cook’. You see the patterns. They were the potential audience for my work. You don’t need TV as your book sells so many. “It’s the same as how I think of Instagram. My thing is focussing on what drives you, when you do your good work. I completely understand why the publishers would want people to be on social media. I am quite surprised how damaging it is emotionally. It makes me think about what everyone else is doing. What everyone else is doing, doesn’t really matter. You take your eye off your own creativity. “If you’ve not done it and you suddenly start doing it, you become incredibly aware. Although I think it’s nice when people show you what they’ve made. “I don’t plan to spend too much time on social media. It’s not good for your art. The food world is like any micro-climate. It’s a weird place with some difficult things in it. “It was ever thus. Food has been like that forever. Have you read the Nora Ephron essay on the 1970s food scene? I read it once a year to remind myself. “All of them come from that kind of background- Elizabeth David for instance. “Do you know Pete Brown? “I have a proof version of his latest book about English food ‘Pie fidelity’. It’s about pie and peas, cheese sandwich, fish n chips, spag bol. We have a joke about who is the lowest class food writer in Britain. He’s from Barnsley. So he’s winning. I’m interested in things like, well I love Chrissie Hynde, Viv Albertine, that DIY punk attitude. Chrissie Hynde is still making albums, she’s incredible. She just sticks to it. I saw her at the Royal Festival Hall recently. I saw The Slits play live at The Vortex, I’d never seen women like that before. Huge role models for me. Do you listen to Mary Ann Hobbs on Radio 6? She’s so brilliant. She has all sorts of interesting people on the show. She plays great music from our youth and from now. I listen to her while recipe testing… I don’t listen to anything while writing because I have to concentrate. She’s got great taste. In summary, what are you saying with your food books? When I wrote Flavour it was really basic, trying to find out what went with each other. It came out with Heston Blumenthal, post-McGee. That’s where my brain was, I don’t know why, I’m not a scientist, I failed every science thing at school. I did teach myself quite a lot about flavour science. Flavour took three years. April 2010 I handed in the manuscript for Flavour. Lateral Cooking has taken seven years. I didn’t take a break between the books. The last six months I didn’t go out, I went a bit nuts being housebound. Writing books can hurt your mental health I’ve found. I’ve become very anti-social. So with Lateral Cooking, I was doing sensory testing and asking myself what would it be like if I add something acidic to it? Or if I add something a bit wet to it? I was creating this file of options of how to flavour things. It was going to be this book about flavouring things. That was the premise. I worked on it for three years with no idea if anyone would want it. I showed it to my editor at Bloomsbury and he was interested. Nobody was breathing down my neck though. Then I got to this point where I started to see the continuums, how the recipes were related to each other. The custard continuum always has 500ml of milk or cream, then- by understanding that your crème caramel has whole eggs and milk, and that creme brûlée has yolks and cream, and then apart from that- they are the same. Then you can make crème anglaise then that is the base for ice cream, and if you add flour in, it becomes crème pat. Ok so now I don’t need any recipes anymore. I understand what family it fits in. Then the book becomes if you make a bread dough, you can make pizza, you can make bagels, you can make croissants. Everyone likes to find out how connected things are. I just want people to make a loaf of bread and then make croissants. Just to know what it smells like. That’s the point of it. Everything in this book I’ve tested at least once. I’ve really really learnt to cook. I can cook more or less everything without a recipe. When I went to Istanbul, I had a revelation about borek pastry, the Silk Road journey of pasta and that water borek is lasagne. That pastry and pasta are the same thing cooked different. I was also thinking about quenelles lyonnaises, how they are related to choux pastry. When I hear about something new, it’s easier if you can relate it back to another recipe. I’m influenced by MFK Fisher, the honesty, that’s who I wanted to be. The other one that is important is the film writer David Thomson, he wrote The Biographical Dictionary of Film. His writing is wonderful, you get lost in his books. Combine the almonds, flour, icing sugar and salt. Make a well and add the egg whites, stir. Add the melted, cooled butter and vanilla. Pour into 10 moulds and bake at 180C for 15 to 20 minutes until golden. Mix the nuts and cinnamon and fold into the egg mixture. Fan out the apple slices attractively on top. Bake for 20 to 30 minutes, watching carefully from 17 minutes. When a skewer in the centre comes out clean, it’s cooked. Santiago means Saint Iago or St James. 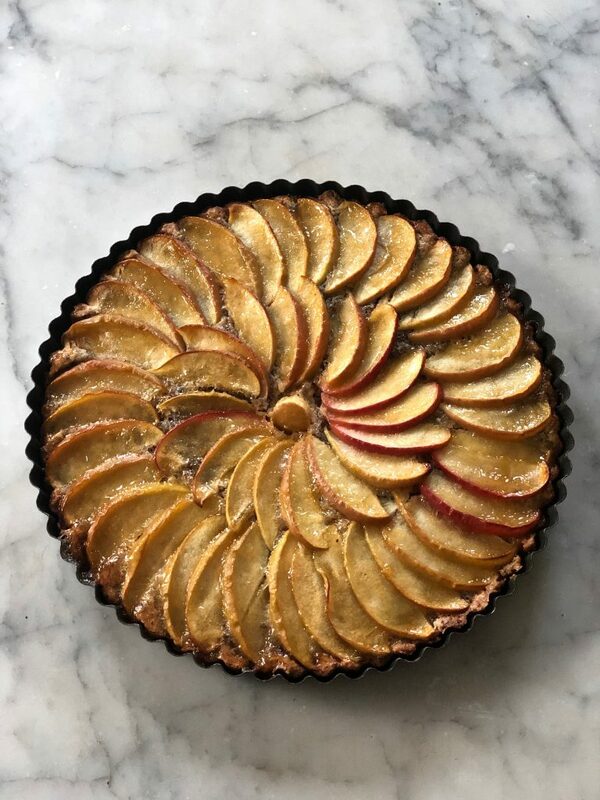 The original apple-less tart by Claudia Roden would have the shape of a cross of St James picked out, via a template, in icing sugar.